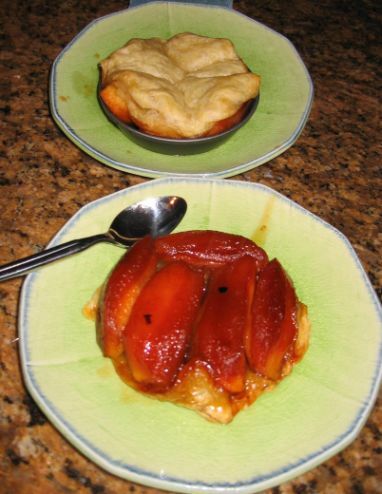 Tarte Tatin is basically an upside down Caramelized Apple Tart. This is a classic French dessert that can be found in most restaurants in France. 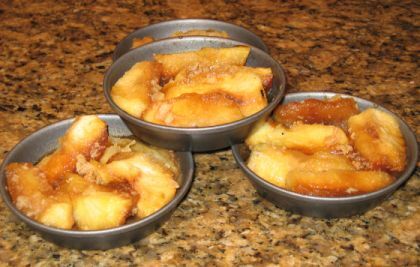 The story goes that one of the sister Tatin (Stéphanie) was so busy so she rushed into the kitchen, threw the apples, butter and sugar in a pan and then rushed out to help with other duties in the restaurant. The odor of caramel filled the kitchen, Stéphanie realized she'd forgotten the apple tart, but what could she do now? She decided to put the Pâte Brisée on top of the apples, pops the pan in the stove to brown a bit more and then turns it upside down to serve. 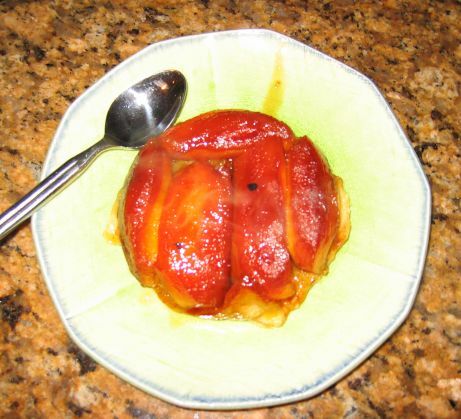 Raves of delight emanate from the dining room and that was the birth of the Tarte Tatin. 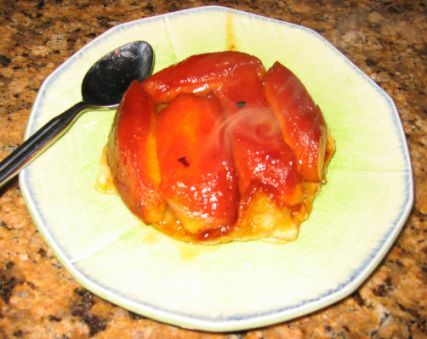 I always like the look of the Tarte Tatin! Caramelized Apples neatly arranged on a bed of Puff Pastry. I usually make a large one but decided this time to do individual one just because it is much easier to flip it once it out of the oven. In the background is the tarte freshly out of the oven. Next, I have to flip it upside down (front row) so the presentation shows the apples on top, the caramel oozing out, and the dough is still crispy warm and soft! 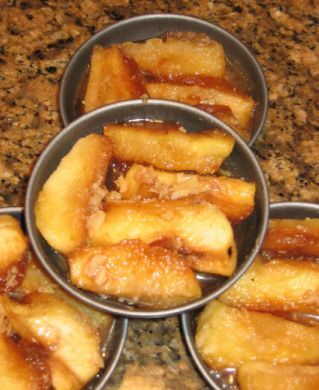 First the Apples are caramelized on a pan with sugar and butter. The process takes about 20 minutes or so. I removed the apples from the pan an arranged them neatly in my mold. 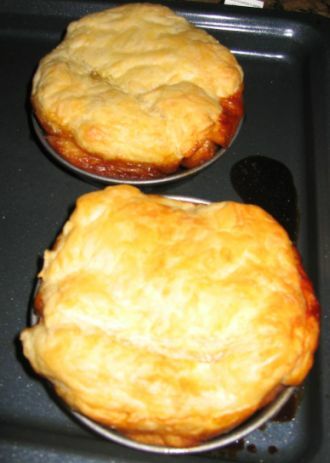 Next a sheet of puff pastry will go on top and they will go in the oven for 20 minutes. Fresh out of the oven! The puff pastry is now done and all I have to do it to flip it upside down.. This the result once the flip is done!